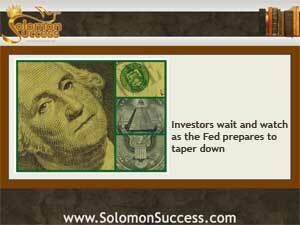 Solomon Success > Blog > Should Investors Prepare for Septaper? As King Solomon tells us in his proverbs, prudent money management means looking ahead and being prepared, just like the ant who gathers food in the summer for the winter to come. That kind of watchful waiting may serve investors well in the coming months, as the Federal Reserve appears to be sticking to its plan to taper down its stimulus plan u a move dubbed “Sepataper” by the press. Just a year ago, in September 2012, the Fed began buying billions of dollars’ worth of mortgage backed securities from lenders across the country in an effort to stimulate the housing recovery. The plan was to get more money back into the hands of lenders so that interest rates would stay low. And stay low they did – hovering at newly unprecedented levels for months and making home buying more attractive. Since the early spring of 2013, Federal Reserve officials have been hinting that it might be time to taper off the buyup. But since the decision to do so hinges on the health of other economic indicators, the timetable continues to shift. Better housing and employment numbers meant a draw-down was near; slowing in these and other sectors suggested the economy still needed the boost from the buyup. But as “Septaper” nears, market watchers and economists as well as everyday consumers are beginning to worry. Stock markets have been jittery ever since the Fed began talking about the tapering, and some financial experts predicted that once the Fed’s stimulus is withdrawn, the indicators that triggered it – the housing upswing and better job numbers – could crash. Without the help of artificially low interest rates, they fear, rates would begin to climb back to levels naturally dictated by the markets, and that would slow housing purchases and stall consumer buying in other areas as well. And that could create the very conditions the stimulus plan meant to prevent. The Federal Reserve Securities Buyup: Past Its Season? The Fed’s Bond Buyup Comes to an End: What Next?